A few years ago when I was visiting Steven's parents, his mom made some Korean pancakes for us. They were so good, I just had to ask her for the recipe. Then I was shocked to see her pull out a packaged mix from the pantry. I always thought that homemade always trumps convenience but that may not be the case with pajeon. After looking at the ingredients in the package, which was mainly flour, I thought I could go home and recreate it. But Steven's mom warned me that she's tried doing that too and the pancakes didn't taste the same. Well, she was right, and with my first attempt, my pancakes were dense and gummy. After my original post over a year ago, I asked readers to share their pe jeon secrets and you guys offered some pretty good suggestions. I decreased the number of eggs from 2 to 1 and substituted some rice flour for all purpose flour. The resulting pancakes were excellent and the closest I've come to replicating the ones made from a package. But if you have access to an Asian market, I would go for the mix because it's easy and the results are consistent. 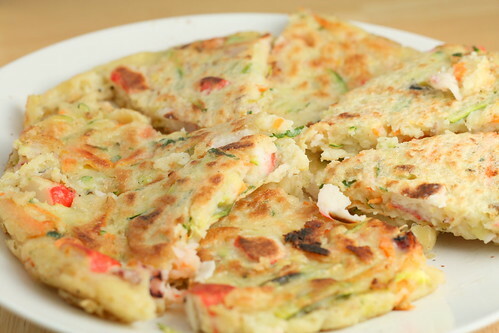 Unlike American pancakes, which are fluffy and usually topped with fruit or syrup, Korean pancakes are crispy on the outside, soft and tender on the inside, and packed with delicious morsels of seafood and vegetables. The pancake we ordered at the Korean BBQ restaurant in LA was probably 75% seafood. I used a seafood mix I got from a local Asian market that was a mix of imitation crab meat, octopus, squid, shrimp, and cooked oysters. Trader Joe's carries a seafood mix of squid, scallops, and shrimp or feel free to use only shrimp if that's what's available to you. Omit the seafood entirely and up the veggies for a vegetarian version. A lot of readers also suggested adding kimchi juice for added flavor but I rarely have kimchi around. In a large bowl add the all-purpose flour, rice flour, and salt. Whisk to combine. Add the egg and start with 1 1/2 cups of water. Whisk until smooth. If the batter is looking too thick, add a little more water. The consistency should be like heavy cream, not too watery. Add in the chopped seafood (if using), grated vegetables, and green onions or chives. 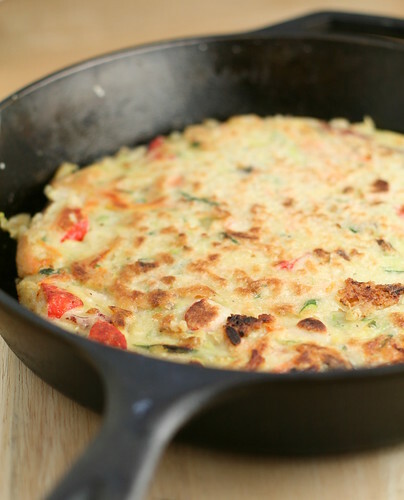 Heat a tablespoon and half of vegetable oil in a nonstick or cast iron skillet over medium high heat. Use plenty of oil, enough oil to cover the bottom of the pan, for a crispy pancake. Ladle one third of the mixture into the pan and spread it evenly in the pan. Cook until the bottom is crisp and golden brown. Flip and cook on the second side until crisp and golden brown. Repeat with the rest of the batter. Cut the pancakes into 8 wedges and serve with dipping sauce. For the spicy dipping sauce, I mix equal parts chili sauce (sambal oelek) with soy paste which is like a thickened soy sauce, Kim Lan makes our favorite. A more appropriate chili sauce would be gochujang (Korean chili bean paste, the Chinese equivalent is dou ban jiang). Adjust the spiciness according to your own tastes. I checked my recipe for differences. I use cold water to keep it crispy. I use 1 egg for 2 cups flour. Not sure if all those things help but thought I'd suggest. This looks like something I definitely have to try. I want to learn more about Korean cooking -- beyond bulgogi and meat dishes like that. Thanks for sharing the recipe. I've never had these, but I would really love to try them. I like how they are savory instead of sweet, but still starchy. Good luck on your recipe-perfecting adventure. These look really great already, can't wait to see what you cook up next. I have never had Korean pancakes but they look great! you should use half cornstarch, half flour to make the pancakes extra crispy. that's what my mom does. kimchi juice is definitely a flavor plus as well, as are thinly sliced korean chili peppers. i also agree with wandering chopsticks that only one egg is necessary. I love these things. Used to buy them at a Korean grocery in my old neighborhood, and they were great! Ah, now I'm craving one!! Ohh that looks so good. You did such a great job on those. As soon as this mini-heatwave we're having goes away I want to make those. stumbled upon your blog while looking for a recipe. i'm chinese, husband is korean and we lived in seattle during his fellowship until last summer. hosoonyi in edmonds has great pajun. so crispy. worth the trip. their soon do bu is also great. ditto the cornstarch and use lots of oil when frying. You are absolutely not snooty to think homemade trumps store bought as I feel the same way-However, if the box works and you have tried homemade to no avail-go for it as it is nice to have a sure fire, quick and easy mix for a change! Use Korean pancake pre mix when you cook. that's the sercret. Even Koreans use premix too because it gives very crispy and perfect tastes. I just made the Pajeon with the korean pancake mix, I only used vegetable. I found this batter from scratch, maybe you are interested to try? I haven't tried it, but I've seen recipes that use a combination of all-purpose flour and sweet (or glutinous) rice flour - usually 1 cup AP flour and 1/4 cup sweet rice flour. Sweet rice flour is different from rice flour - sweet rice flour is used to make dduk, and I can see how it would lend a more moist texture to pa jun. And I'd use either 1 egg, or omit it altogether. Good luck! I add some corn starch, 1/2 a tsp of baking soda and about 2 tsp rice vinegar. I'm not familiar with the pancake mix instructions but if it says to just add water, I would hold off on the egg. use rice flour and glutinous rice flour along w/ wheat flour in equal parts. Also, let me know if you are ever interested in a one off guest writer, I would be more than happy to post a delicious recipe on this site, I'm liking it very much. Thank you for the recipe ;) I just surfed the net for this recipe and saw your post and decided to follow it .. it went so well ;) yummy. hubby and i were very happy with the turn out ;) thanks..